@Micheru : waw dear thank you so much. for these happy wedding photos. it's great! 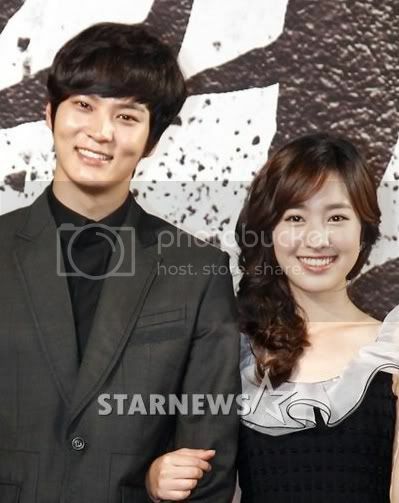 i want to say that i am one of the biggest JooSeyeon (Joo Won & Jin Se Yeon for those who don't know) shipper out there. i said on "Bridal Mask" thread that the day JW and JSY announce they are dating should be declare a national holiday. seriously, these two are so compatible with each other! they both have a cute and bubbly personality. they're respectful, dedicated to their work, and have such a warm aura that everyone is immediately attracted to them. plus, JW and JSY have megawatts smiles that could power the whole planet. judging from "BM" BTS videos and photos, they look like they like each other, maybe in a working relationship kind of way or something much more deeper. sincerely, the age difference is not that much... they're both legal adults, so i can't see why it won't happen. but... only time will tell. Pic of JW and JSY from Bridal Mask BTS. Luckily we have Five Fingers to move on and satisfy the need to see JSY. I've always been happy with her casting on FF, that I don't have to wait at all to see her in new drama. But now I'm feeling much more grateful that she immediately choose her next project, it makes me can let go of MD and BM ending sooner. The usual way for me to wash away the sad feelings of saw my favorite OTPs sad ending in dramas that I watched is to watch other dramas of the said actors/actresses. So I'm happy I have Five Fingers to focus on now. But not that I want to forget about MD, KT, and BM. KT x MD will always remain to be one of top favorites in my OTP list :x Love them. You had big shoes to fill after Uee on OB so I was pretty indifferent about you in the beginning as JW’s new drama partner, but for a girl so young, you proved that the director did well to cast you. No matter what others might say about your acting, for someone your age, you are off to a great start. You brought this role to life and made her likeable, but your off camera real life persona really endeared me to you. Watching how attentive and considerate you were to all the cast, staff, and extras made me see why you were so well liked by everyone. You made JW’s job easier by being a great female lead so thank you for everything. Good luck with your new drama even though I won’t be watching. Don’t take that personally cuz the preview put me to sleep a month ago even before you signed on. One more thing, please don’t let your character die tonight. what should i do.......i guess the happy touch situasion in ep.27 will continue to ep.28 but that was nothing came to ep.28 ~ oh no, it's not fair! I agree with you. whatever the ending of BM, JW and JSY always the TOP couple now, ever and after. I also will focus to Five Fingers, but my feel always goes to kangdan BM couple. so i can enjoy to see my JSY in FF but not indeed likely at her filming in BM. ( cause nothing JW in ) but FF also cool cause our JSY be there. @lovinslevine Hello, if you have been lurking at BM thread then you probably have seen my name. I am also a JW-JSY shipper. I hope I am welcomed here and thank you for creating this thread where we can talk about JSY. I see that there are few of BM fans here "waves" to @Pavlichenko, @kaeru-chan , @Micheru. I have just finished watching BM and is still in KT-MD withdrawn mode so although I know that JSY is now filming in 5F, it won't be easy since I have not yet used to see her's partner other than our beloved JW so you need to bear with me. I don't have a lot time but will drop by here when there is news about JSY. I will post more once I am out BM withdrawn mode. At the moment I am still reeling over MD death, but I will come back when I can. @Jessi15 : Hello.. yes, i have been saw you in BM thread dear. you are most welcome dear for loving our JSY thread. yes.. i hope can see you more often here. im so glad knew you really love our JSY. thanks dear so much for support her. yes, here have not a lot fans of BM, cause there thread of BM where fans of BM can talk about all casts, but here thread of JSY, so other people come to BM thread is enough for see JSY. but i will drop by here and will post her all old/new stuff, cause her debut was in 2010, so we need inform her other fans about her old stuff and also we must complete her stuff from her awesome drama with our nice joo won in "Bridal Mask". although you don't have a lot time, but im feel so grateful to you dear.. cause you are so nice, with your few time, you still will drop by here when there is news about JSY. some people don't like SY's acting, but sincerely, she started acting over a year ago! she is still considered a rookie actress, even though SY is getting leading roles nowadays. there are a lot of Korean actresses who have acted for 5 or more years, and they're still bad. like i pointed out, each role she got was a small one. SY probably picked up a few acting tips here and there since her debut. i will admit that her acting in "IODG" was lackluster, but in "BM", i thought SY did a good job with what she was given. SY still has room for improvement in her delivery of complex emotions though. i'll post those wedding pictures that you wanted in a while. regarding "FF", i think with 2 hot guys vying for SY's affections, there have to be a final decision of who she will choose. so i think we will get a beautiful wedding scene, but please, don't let it end in tragedy! @Jessi15 i love reading your analyses in "BM"'s thread. i hope to see you in "FF" as well. i think everyone is going through "BM" withdrawal. i spent the whole entire day in utter sadness and anger. i am so looking forward to the weekend where SY is happy and alive in her new drama. @Jessi15: Hi, welcome to this thread! :x Hope to see you often here. Of course it's OK for you to gush about JW x JSY here, most of us (if not all) here are their shippers anyway, at least for now, since we all haven't watch MDtF and only seen her for 2 eps in FF so we pretty much can't form opinions about her with other actors yet LOL. But even if JW is her 3rd 5th or even 10th male co-star, I feel that most likely I'll still ship them hard. Their chemistry, CF, story, and BTS in BM were so compelling. maybe i just can to make comments here since i dont know how to stalk kekekekk yeah i'm a fan, not a stan yet and i'm sorry for my poorly english since its not my mother language, so please bear with me, and i depend on you guys for every updates about our deary JSY..
@Pavlichenko i am not creative enough to make up such a name. though, i wish i did! i saw people on tumblr used the term, and went on urbandictionary to find the meaning. back to the subject of talent agencies, i think having good and smart representation is fundamental to a star's success. if i remember correctly, Kim Soo Hyun didn't become famous until he switched agencies. 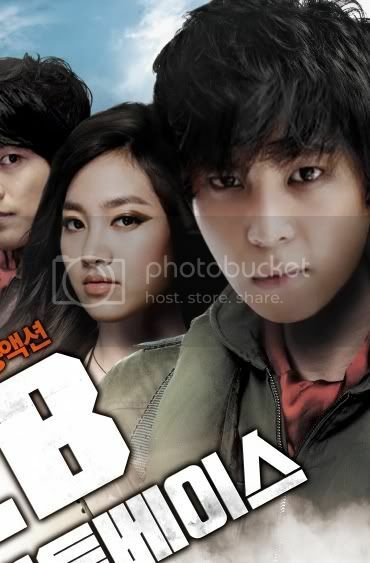 he is under Keyeast, which is owned by Bae Yong Joon, who kind of gave him the role in "Dream High." another example that just popped into my head is Park Min Young. she was kind of having bad luck with choosing projects until she switched agencies, and her new management landed her the role in "Sungkyunkwan Scandal." anyways, i'm sorry for rambling about other people. back to SY! i think her agency knows how to represent her in the best way, so they will get her the best options of roles in the future. sincerely, i don't want SY to be stuck in one role either. hopefully, after "FF", she will get a more meaty and memorable part. right now, i think SY is being underutilized in "FF", but maybe in upcoming episodes, her character will become more complex and interesting. here are the wedding photos from "MDtF" that you wanted. unfortunately, the production team decided to do a traditional Korean wedding for the drama, but the characters of SY and Choi Jin Hyuk did go out and try on white wedding dresses in one episode. i will post those photos up as well. enjoy the pretty, my friends! credit to http://cafe.naver.com/fanofjinsayeon/110 ^ no matter her partner, she looks really good next to him. now i can't wait to see what "FF" has in store for the character of Da Mi. here's hoping that we get to see SY being married to Joo Ji Hoon and Ji Chang Wook. hahaha! not at the same time, though! but a girl can dream, right? credit to kimcunmae on SY's baidu ^ gah! doesn't she look gorgeous? SY should do a pictorial for a bridal store... with JOO WON! :x wouldn't that be awesomely epic? @lovinslevine : i do watch Five Fingers,and now i'm catching up to ep 5-6, when the adults casts appear.. tbh i hold onto myself to not watch it until BM has ended, to avoid mixed feeling between this two dramas and i want to keep MDxKT memories first..